1888: A Jack the Ripper Novel, is available to buy from Amazon now! First of all, apologies for not having updated in a while. I have been away on holiday in (not-so) sunny Brighton so haven't been able to post as much as I'd like to. What follows has been brewing in my head for quite some time and is probably going to be a bit more political than my previous entries. Writing about real life victims of a killing spree comes with a certain level of responsibility on behalf of the author. The tragic lives of the five women who form the heart of my book, had to be treated realistically but with an utmost respect. In the past, the canonical five have been portrayed in wildly varying ways - sometimes as titillation in trashy horror movies, or a band of plucky sisters with a terrible secret to hide. Occasionally they have been drawn as down on their luck good-time-girls, tarts with hearts of gold and bosoms to match. The truth was that the prostitutes of Whitechapel were far more likely to give you a black eye than they were to sing "Oom-Pah-Pah" atop a table in a tavern. The reason for this depiction is simple; it is easy to elicit sympathy from your audience when your victims are unburdened by unflattering characteristics. Right from the beginning, I was determined that these women would be portrayed as accurately as possible, warts and all, to expose a dark truth of the Victorian era; that Polly, Annie, Liz, Catherine and Mary were victims of their society, long before the Ripper ever found them. To the unsympathetic reader, it can be easy to blame the five for their predicament. They were all alcoholics, many of them drank several times the money they would require for a stay in a dosshouse of an evening, many were violent, one was imprisoned for drunk and disorderly conduct and was released less than hour before she was murdered. However, there are interesting things to remember about these women. Mary Kelly spoke four languages and was a voracious reader. Annie Chapman came from a well-to-do household and enjoyed a very prestigious education for a girl in that age. Liz Stride once owned and ran her own coffee shop. Sometimes it is easy to imagine that the poorest members of our society are there for a reason - they failed through laziness, incompetence or just plain idiocy. The myth of the deserving poor is that society is constructed in such a way that only those who asked for it, end up falling to the bottom. I hope that my book will help to prove that this is simply not true. The worst failings of the Victorian era, always fell upon the women of the age. 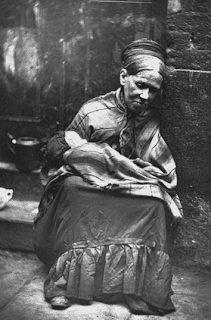 An unmarried woman of a certain age who had no savings of her own, would quickly plummet through the various levels of destitution until she found herself bereft of a home, penniless and with only her body left to sell. This was a time in which there was no safety net. If you fell into poverty, there was no way out and there was no help. Society was so cruel, that to falter even once could lead to a lifetime of suffering. The prostitutes of Whitechapel had to work all the hours they could muster and lived with the constant fear of violence, starvation, disease and an early death. Against this backdrop, who could not excuse them the simple, brief escapism that only gin could afford them - an indulgence that could numb the fear of another night of walking the streets alone. It would take almost sixty years from the autumn of terror before the British welfare state was introduced. By 1945 and the Attlee parliament, security measures had been put in place to ensure that the chasms of inequality in society, could be reduced to cracks - and instantly hundreds of thousands of people were afforded a shred of hope that was previously denied to them. Far too late for our unfortunate five, but perhaps my novel will in some small way, help to remind a British audience, just how far we have come since those dreadful, unforgiving days.